Why do three extraordinarily talented women return as Art Bra Austin artists year after year? For Diana Saunders, Claudia Tejada and Carolyn Jackson, it’s easy — to support BCRC and to honor those affected by breast cancer. Two of these tireless creators — Diana and Claudia — have been participating since 2010, while Carolyn, also a survivor, has created bras off and on since 2006. With determination, commitment and talent like this, it’s no wonder Art Bra Austin continues to grow and dazzle every year. Thank you, ladies! This experienced seamstress has sewn for herself and her family for many years, and has a passion for art, crafting, design and decorating. “I love how important creativity is to me and then seeing my creations evolve from an idea to the finished result,” she says. 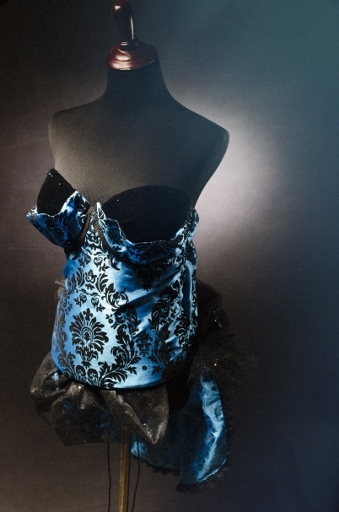 Diana was inspired by the 1880’s era of Austin’s history, when a notorious area of downtown existed with its many “entertainment houses.” She used bright teal and black flocked damask fabric, rich black velvet fabric, lace, ribbons, braids, crystal beads and glittered tulle. She started with a sketch of her design, but then allowed the creative process to take over so the bra came together along the way. 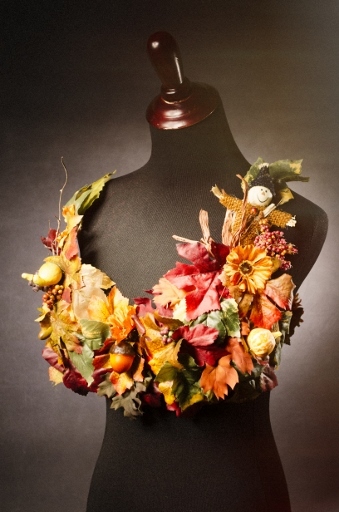 She created this bra in memory of those she’s lost to cancer and in honor of those who have survived. Inspired by her friends’ journeys with cancer, she wanted to create a design that depicted brilliant light, joy, and beauty. Using silver gossamer netting, faux pearls, crystal faceted beads, vintage art deco style rhinestone jewelry and accent pieces, Claudia began putting elements together without a precise plan, but says she was thrilled with the results. This 12-year survivor and former Home Economics teacher says that using her talents for Art Bra Austin is a way that she can give back to BCRC because the Center was invaluable to her after her diagnosis. Since then, she’s gone on to establish the Lee County Area Cancer Resource Center in order to provide similar resources to an underserved area. Carolyn was inspired by all the changes that happened in her life as a result of her diagnosis and treatment, so she gathered a variety of silk flowers and leaves, fall floral picks, and dried foliage to depict breast cancer survivors becoming more vibrant and beautiful people.